You know what tastes a whole lot like fall and isn't pumpkin? Apple pie. You know what's way easier to make than apple pie, and goes on a dozen different things to make them taste incredibly dessert-like & festive? 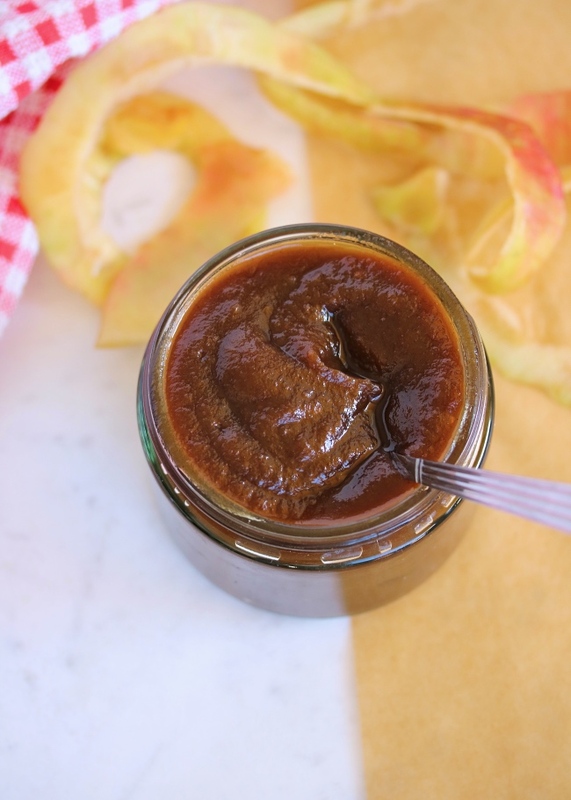 Apple BUTTER! I set out to make this in my slow cooker- a Paleo friendly version, basically just meaning no refined sugar, and started it before bed. Went to bed, and woke up to another regular morning. Dathan was already off to work by then, the cat was sleeping in bed next to me per usual, and then it hit me: the smell of apple pie!! That was all it took- no snoozing the alarm, I practically ran downstairs to check on the slow cooker and could not have been happier with what I found! 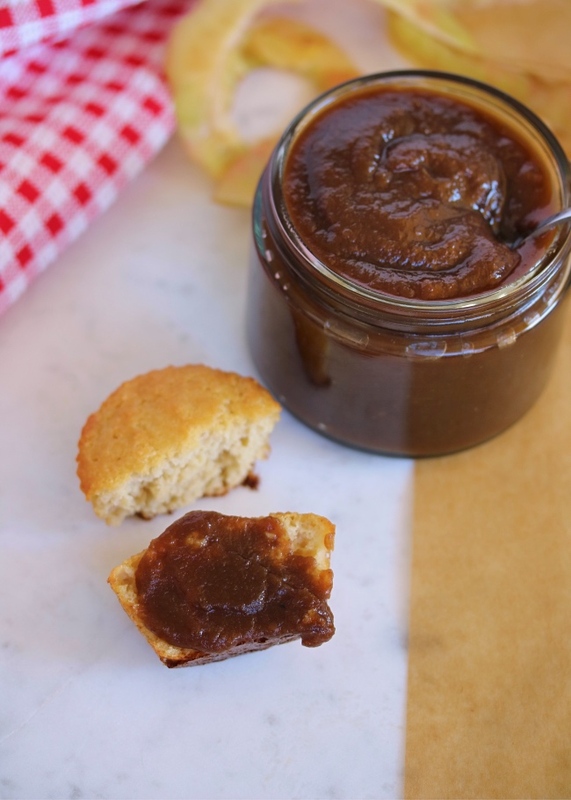 All it took was a few seconds in the blender (we have a Vitamix but really any blender would do, it was so easy) and this apple butter was officially a thing. 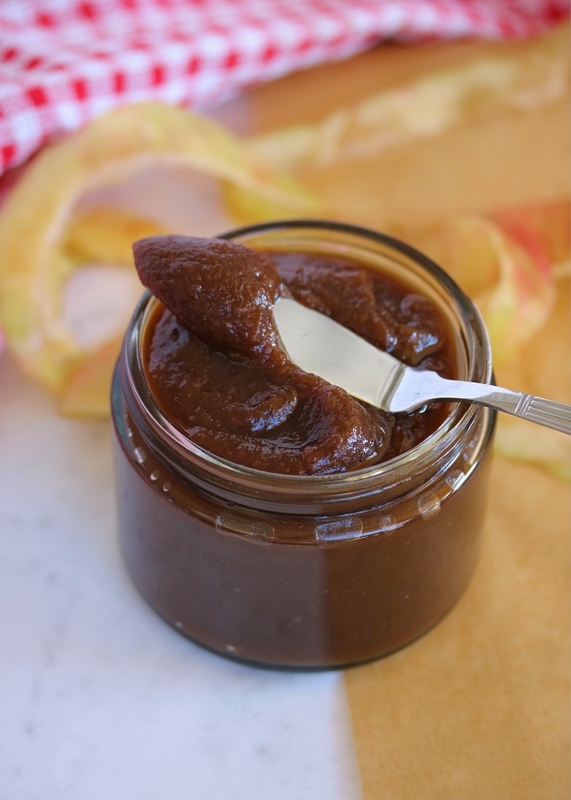 Jarred it up- and was hit with SO many ways I could use it because it just tastes incredible! 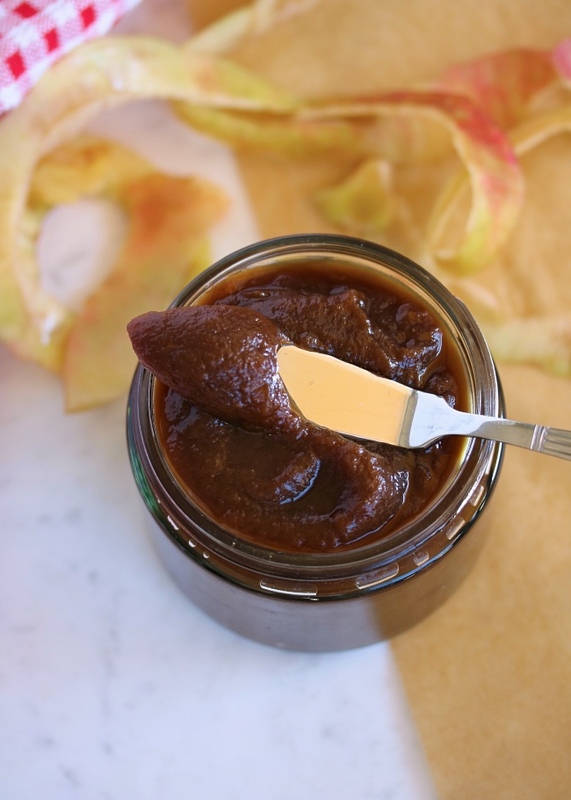 Like apple pie filling but with a deeper, more cinnamon sweet flavor that is just to die for. Spread it on your waffles, pancakes, biscuits, or cornbread (recipe for this coming SOON). Scoop it onto a sweet potato, over some dairy-free (if you're sensitive) vanilla ice cream (you're welcome). Stir it into your oatmeal if you eat it, or put it over basically ANY baked good (Paleo or not) or into a sweet potato breakfast bowl!? I cannot explain how good this is- I just ask that you make it, jar it, gift it, LOVE it!! See my notes below for how to store it (it lasts forever!) and ENJOY! Peel, core, and chop the apples into large chunks. Add to a slow cooker, along with the remaining ingredients. Stir until combined. Set the slow cooker to "low" for 10 hours, stirring once partway through to avoid burning. Transfer to a blender (or use an immersion blender) and blend until smooth. Store in airtight jars, and spread on waffles, pancakes, biscuits, or cornbread, or scoop onto a sweet potato, over ice cream, or into a bowl of oatmeal. 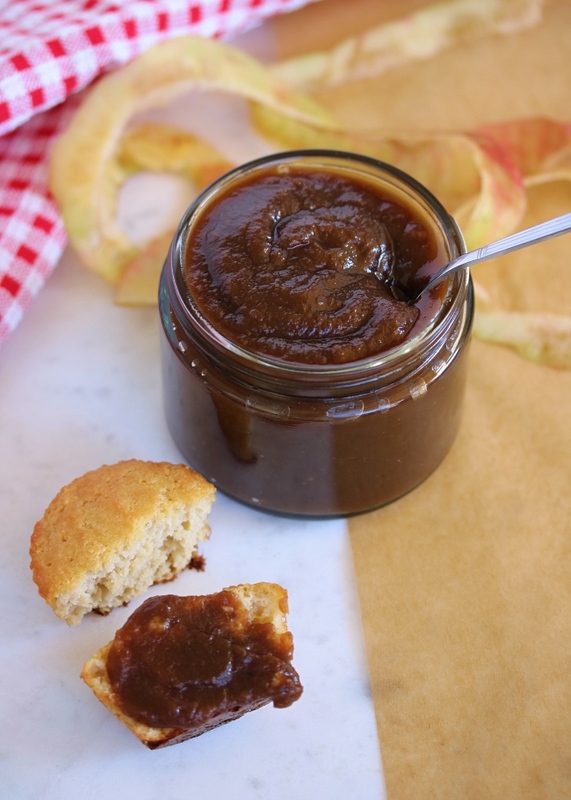 This recipe makes around 20 to 24 oz of apple butter, which I used to fill 2 mason jars. You can put into whatever size sterile jar you like. Store in the fridge for a few weeks, or the freezer for several months. This looks so delicious and the perfect gift for anyone! Can't wait to try this recipe this weekend. 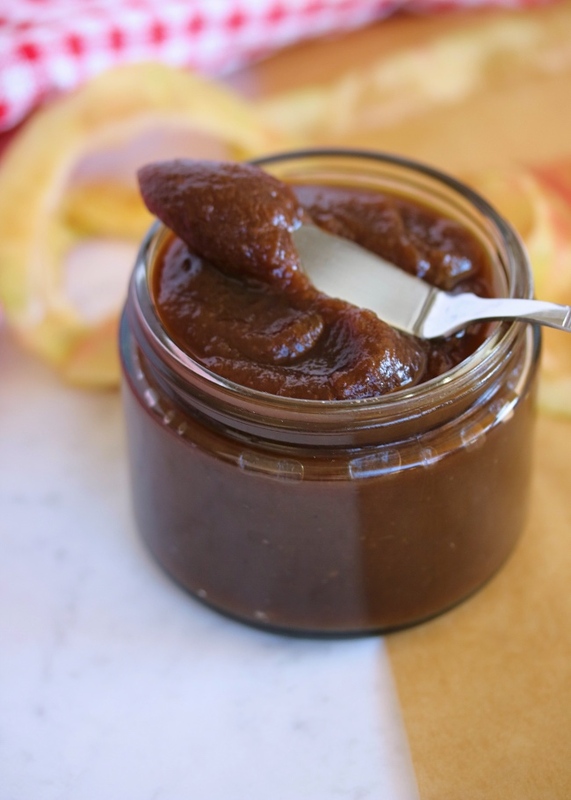 I love apple butter!! I am so excited to try this recipe! I have 5 pretty large apples, do you think I should scale the recipe up or only use 3 of them? Thank you so much Diane!!! I hope you love it, can't wait to hear what you think! Hey! Do you think I should use the slow cooker setting on my instant pot or try a different quicker setting? Diane- you're the best for sharing!! Thank you so much, that's so, so helpful! And I'm so glad you loved it!!! Hi Jessie, this was a great recipe! I ended up making it in the instapot too and it worked perfectly! I paired it with your previous corn bread recipe and packaged it up as a gift to a friend. Btw, I just wanted to say how happy I am I came across your Instagram and blog, I am also pregnant, due Dec. 3rd and in the recent months my husband and I have really been changing the way we eat so your blog has been an amazing resource for healthy and wholesome meals. My husband has been amazed at how much better he feels after eliminating diary from our diets and switching to paleo/whole foods. With the new baby soon on its way I have been meal prepping and getting a meal recipe book together and I can tell you I have already added so many of your recipes, we love how they have been turning out! I am also very interested in the beauty counter products and have been eliminating toxic/unnatural ingredients from our everyday living so this is great to be able to find new products that are all natural. Thank you so much and I look forward to continuing our healthy pregnancies its exciting to know our babies are both due around the corner! Hi Jennifer! Love hearing that it worked well in the Instant Pot! Congratulations on your pregnancy- we are in the home stretch!!! Love that some of my recipes have helped you guys, and so grateful to have you here with me!! Sending you all the happy vibes for the end of your pregnancy and welcoming baby!! !